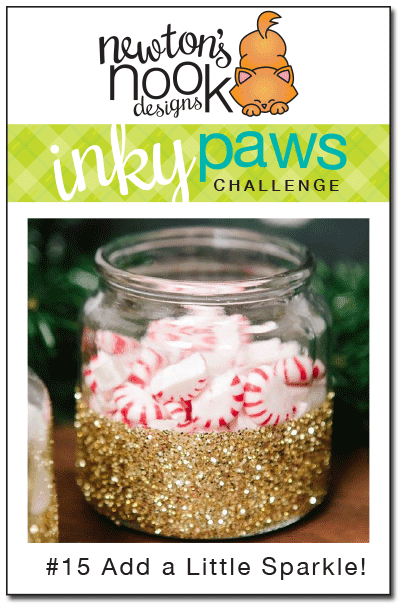 Inky Paws Challenge: Inky Paws Challenge #15 - Add a little Sparkle! Inky Paws Challenge #15 - Add a little Sparkle! Happy Friday and the the first day of #15 Inky Paws Challenge! Get out that glitter and bling and show us what you can create! You have two weeks to play along. Deadline to enter is Friday, November 7th, 2014 at Midnight CST. The winners will be announced on the NND blog on Sunday, November 9th. Several of our Design Team Members decided to play along - I just LOVE the assortment of Holiday, Fall and Halloween sparkle they created! Read the description below each card to see who made it! 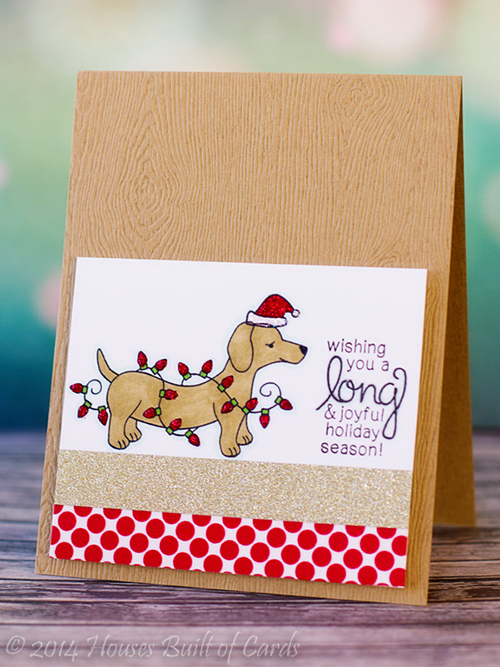 Our guest designer for October, Heather Hoffman decided to play along with this adorable doxie card- check out the sparkles on the hat and lights! She used our new Holiday Hounds set. 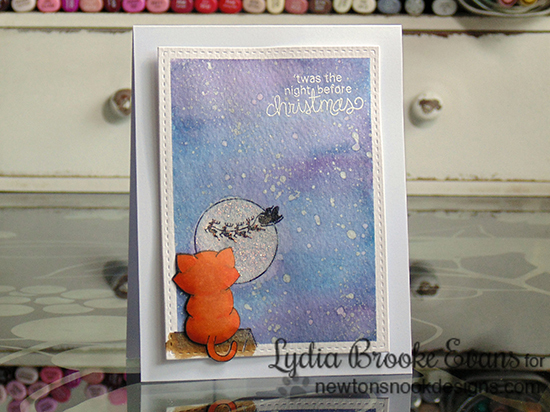 This pretty card by Lydia has a beautiful sparkly moon - She used the cute kitty image from our new Newton's Curious Christmas set. 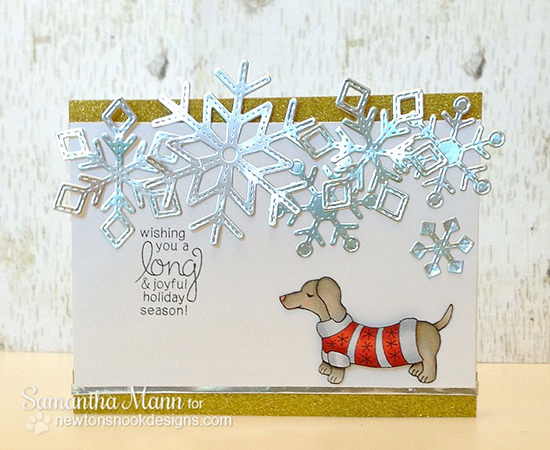 Samantha added some bling to her card with those pretty foil snowflakes! She also used our that cute pup in the sweater from our new Holiday Hounds set. 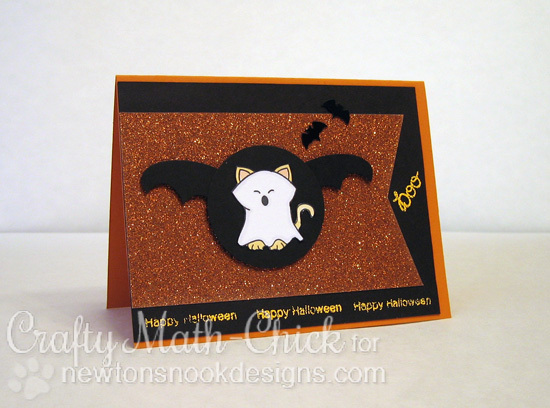 Crafty Math-Chick created this super sparkly Halloween Card! That sparkly orange paper goes perfectly with our little ghost kitty from the Boo Crew Stamp set! 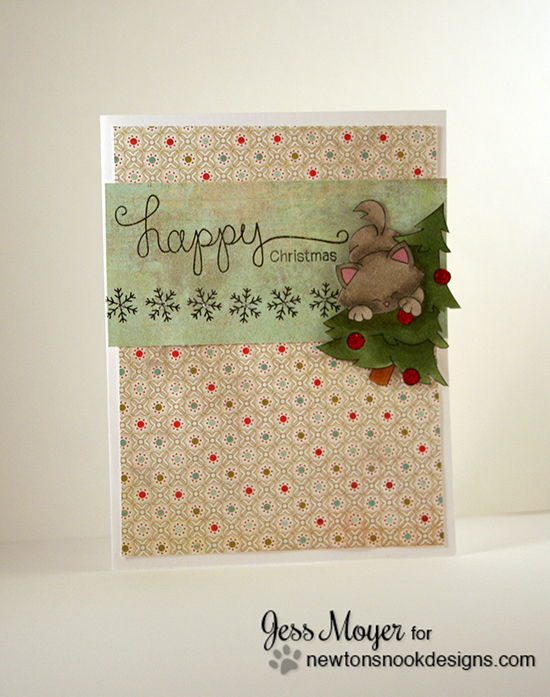 Jess created this cutie with the sparkly ornaments on the Christmas tree from our Newton's Curious Christmas set! Love the little row of snowflakes with a sparkle in the center too! Larissa stamped this beautiful row of glittery leaves using the Falling into Autumn Set! So pretty! 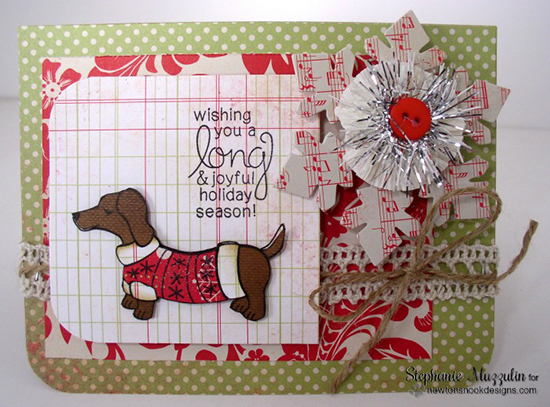 Another cute doxie card using our Holiday Hounds stamp set - this one is by Stephanie! She added sparkle to with some pretty tinsel behind the button! Tessa combined our new "sweater weather" sentiment from the Holiday Hounds set with the "hello" from the Winged Wishes set and the cute basket of yarn from the Basket of Wishes set. Love this combo of fun images and sentiments and the little glittery paper strip! 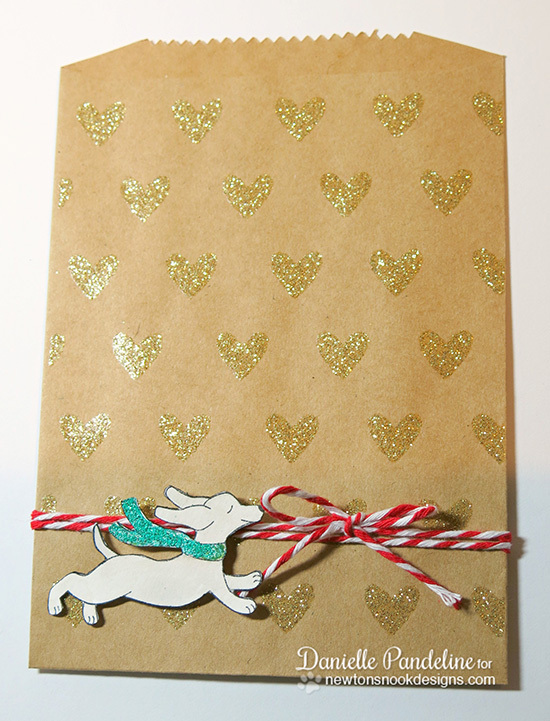 Danielle created this adorable little treat bag using the the doxie from our Holiday Hounds set - he has such a pretty sparkly teal scarf! 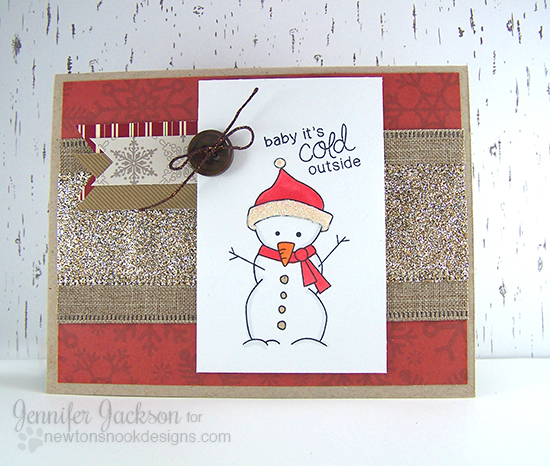 Here's one by me - I used our sweet snowman from our Frozen Friends set- and gave him a glittery hat. I also added some fun thick glittery ribbon (from the floral section of the craft store) and a bit of sparkly brown twine through the button! Now it's your turn - we can't wait to see how everyone blings up their cards with sparkles! !